Dark Chocolate Mix: Warm Medium Brown, Dark Auburn, and Dark Brown Blend. 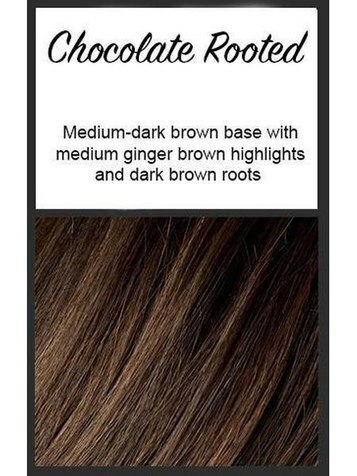 Chocolate Rooted: Medium to Dark Brown Base with Light Reddish Brown Highlights and Dark Roots. It is only saying "dark chocolate" for me when I hover my mouse over it...under the Start wig, right? It isn't for me. I am on Firefox though and I find their browser to be weird. Juat tried it on Explorer and "Dark Chocolate Rooted." I can't imagine what root colour they could put on that unless it is jet black. That's what Misty has said also. She is from Brisbane. 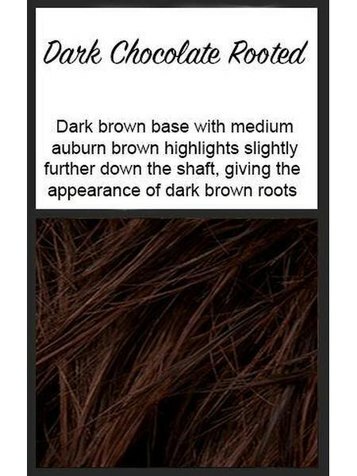 on the sister site that wig is shown to come in chocolate rooted as well as dark chocolate rooted. 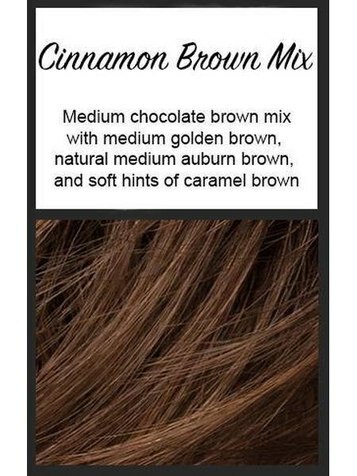 There is also a pretty cinnamon brown mix. I know that I have seen the chocolate mix and other styles but not in this one. I love EW browns. Beautiful. seriously, the only EW color I have ever seen that I liked at all was Tobacco Rooted. And after buying and sending back 6 EW wigs I don't think I would ever buy another one. Hi Vee thanks for checking those colours and I have just ordered the Start wig in Dark Chocolate rooted, I hope it will not be too much hair for me , so can only wait and see..I hope my order will not prove a problem if I have to return it .. I love Mocha rooted, that's my favorite color. But I get it. It can be hard to find just the right color for our skin tones. Yep, stick with what works for you. Hi, in the past 9 months, I bought several wigs from EW. I love the color Hazelnut, be it rooted or mixed because it is a medium to dark brown with beautiful auburn & caramel highlights that gives the effect of a medium brown soft highlights. If you like medium to dark brown, but not real dark like expresso, chocolate rooted is perfect. It is actually the alternative to Hazelnut, I think, in the newer EW wigs. I ordered a few in the cinnamon brown and it has way too much red. It looks like I dyed my hair red, like one of those little old ladies who will dye their hair forever, not a good color at all, in my opinion. These colors don't always look the same even if it's the same wig. I like Open by EW and I have two, same color but they are both different, luckily in a good way. I know this must sound dumb but being new to wigs and wig sites .... what is the sister web site ?? You can use the site name. You cannot use the .com extension with it as that is a link. There are some weird exceptions though. You cannot say "w ig company" yet this is very often used when someone is explaining something about ordering from a w ig company in Australia, for example. It is a little challenging though when someone gets queued because they type "wigs.com is the ONLY w ig company I would ever buy from!" This has happened a couple of times now. An innocent remarks and oops! where do you live? I know that #Moonlitnight, who lives in Canada, can't see some videos from cyster wig site nor can she order from there anymore. Some weird new policy they have. This is probably why you are getting the 402 error. I live in Sydney Australia and Yes I too can not longer see the Cyster site , I originally could see it but now it is barred. I can still see some of the Reviews though just on the Youtube. Where about's do you live.. I know it is such a big time lapse between some of us . as it is now 7.45am here Friday morning . Maintaining femininity after hair loss? Advice for Men with Hair Loss?